Sysco Corporation, through its subsidiaries, markets and distributes a range of food and related products primarily to the foodservice industry in the United States. 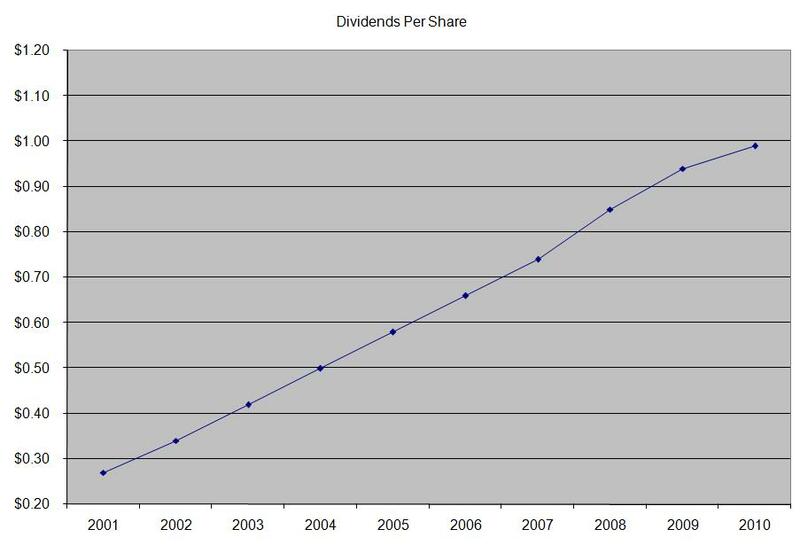 The company has raised dividends for forty consecutive years, and is a dividend champion. 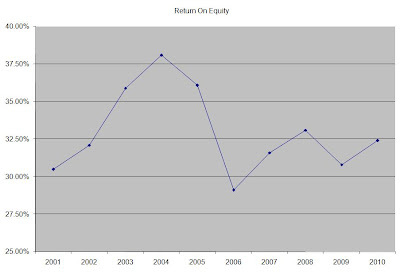 Over the past decade, this dividend stock has delivered a total return of 4.40% annually. The stock has been mostly flat over the past ten years. Over the past decade, Sysco has managed to increase earnings per share by 9.50% annually. The company has bought back 1.50% of its shares outstanding on average over the past decade. 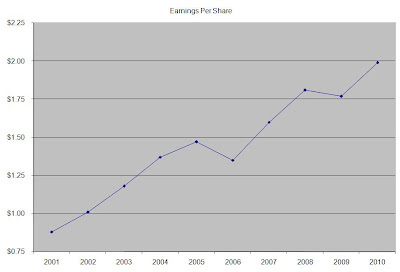 Analysts project Sysco to earn $1.99 in FY 2011 followed by $2.15 in FY 2012. The company has managed to raise annual dividends at a rate of 15.50% annually over the past decade. 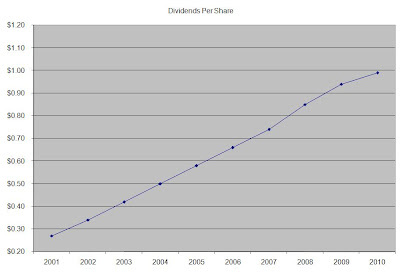 At 16%, dividends double every four and a half years. Since 1974 the company has managed to double its quarterly dividend payment every four years. The company’s dividend payout ratio has steadily increased over the past decade. Right now the dividend is sustainable at payout ratio of just under 50%. A lower payout is always a plus, since it leaves room for consistent dividend growth minimizing the impact of short-term fluctuations in earnings. 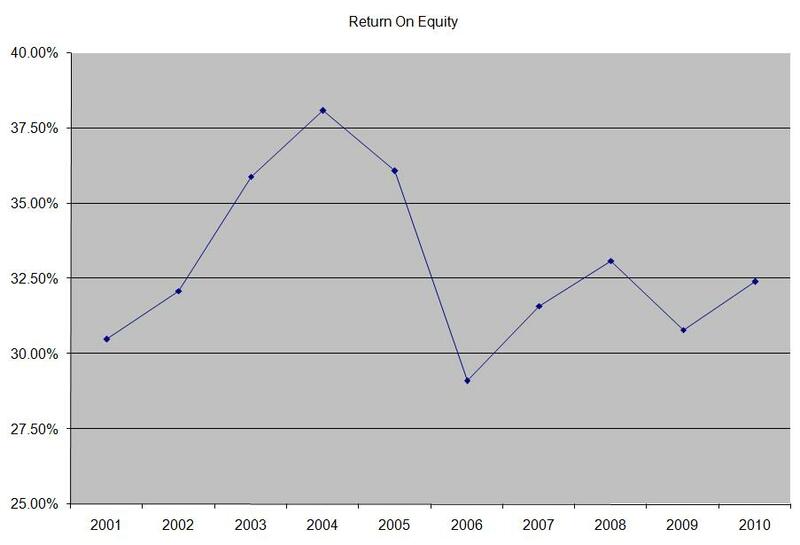 The return on equity has remained steadily over 29% over the past decade, fueled by strong earnings growth. Rather than focus on absolute values for this indicator, I generally want to see at least a stable return on equity over time. Overall I find Sysco (SYY) to be attractively valued at a P/E of 14.20 and a yield of 3.50%. Given the adequately covered distribution, and the expectations for modest EPS growth going forward, I view the company as an attractive candidate for a dividend growth portfolio.